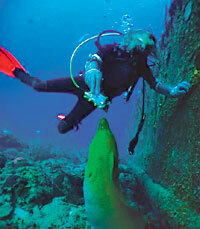 St. Croix’s coral reefs is the largest on any caribbean island. These beautiful coral gardens dive sites are on long reef or scotch banks. Join us to explore our wonderland! Chez Barge (right): Sunken Sand Barge. A great dive site for night dives, where you can see plenty of lobsters and crabs. Eagle ray: Just outside of the harbor entrance, mooring in 28 feet, gentle slope big coral heads in sand. Often see eagle rays feeding here. Great dive for beginners as well as advanced. Blue Chute: On Long reef near the barge. Healthy corals lots of tropicals occasional eagle ray. WAPA: On Long Reef across from the Water and Power Authority plant. Sloping coral with sand chutes between them. Good place to see lobster and nurse sharks. Sleeping Shark Hole: A large coral over hang where one to four big nurse sharks hang out. Beautiful sloping reef down to sand shoots. #1 Bouy: A Sloping drop off just outside the harbor. Schools of mackerel scad, yellowtail snapper and jacks. Southern stingrays love the sand at the top of the drop off. Stingray Sted: That’s stingray city for you mainlanders! Yes, you’ll see southern stingrays, sometimes several of them together in the sand at the top of a sloping drop off. The channel here attracts many large schools of fish. Scotch Banks: This long section of coral reef at the eastern edge of Christiansted harbor area. These patch reefs hold many surprises! Love Shack: Big sand shoots and large coral heads. Lots of lobsters, crab and small nurse sharks. Cormorant: Sloping coral formations. Good for small tropicals. Twin Anchors: In about 45 feet a very large 200 year plus anchor from the old Danish days of St. Croix. Probably from the sugar plantation days. Over 8 feet in length. 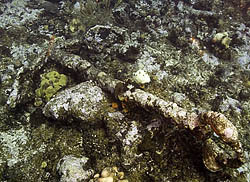 Another anchor in 55 feet lodged in the corals and covered in coral. Healthy corals and lots of tropicals. White Horse Reef: Two small reefs nearly breaking the surface. Many a boat has sunk here. You can find broken cannon, old wood and nail and chain from very old boat. New boats have hit it too. Nice shallow dive. Gentle Winds: Named after a condo on the beach there. Healthy corals lots of marine life. Mooring starts in 40 feet, gentle slopping seascape.